Non-destructive testing (NDT) of concrete structures is performed using pulse-echo methods. According to the type of the applied waves it can be classified as acoustic (Impact-Echo, Ultrasonics) and electromagnetic methods (Radar). The results are visualised through different imaging processes. This work is performed in the frame of a research project promoted by Deutsche Forschungsgemeinschaft (FOR384).The objective of data fusion is to use the complementary information of the different methods. Radar can detect metallic reflectors in concrete (metallic ducts and concrete reinforcement) very well. This method is not able to locate defects behind these reflectors (injecting defects, defects behind close concrete reinforcement), because the electromagnetic waves are completely reflected at metals. The acoustic methods are able to compensate this deficit i.e. acoustic waves can penetrate through metal. But acoustic waves in the ultrasonic range are completely reflected by air layers. Air layers have smaller influence on radar propagation, so that both methods complement each other.In order to be able to combine the NDT-data from several methods records at the same volume, the different data setsmodes of signals must be adapted. The ultrasonic and radar data have to be reconstructed with programs based on the Synthetic Aperture Focusing Technique (SAFT) before data fusion. Subsequently, a conversion of the data into a uniform format has to be carried out. This is a prerequisite in order to keep the data exchange between the project partners as simple as possible. After the data sets are imported and transferred into a common reference system, they can be processed with operations according to the purpose of the investigation. Results, which have been achieved in concrete test specimen with radar and ultrasonics, will be presented and will show the feasibility of the data fusion method. The maintenance of existing buildings made of reinforced and prestressed concrete involve high costs . By systematic application of NDT-methods and supervising within a building management system, repair costs for existing buildings can be reduced considerably. Before a significant damage progress is noticed at the surface of a structural element, damages can already be assessed or be localized prematurely by these techniques. For NDT of concrete elements, impulse-echo techniques like radar, ultrasonic and impact-echo have shown a great potential for localisation of voids, honeycombing and structural elements as well as for the detection of grouting faults in tendon ducts [2,3]. But for increasing the resolution, for unambiguous data interpretation and for taking advantage of different physical effects, more basic research is required considering also data fusion of different methods. On that account a research project (FOR384) promoted by the Deutsche Forschungsgemeinschaft, has been initialized (www.for384.uni-stuttgart.de). The title of the project is Non-destructive evaluation of concrete structures using acoustic and electromagnetic echo methods. As partners several German universities and institutes are cooperating. The target of this research project is to enhance the development of impulse-echo methods for on-site inspections of concrete elements to a level of systematic and routine application and validated diagnostic procedures. The combination of radar, ultrasonic and impact-echo data by data fusion is one of the main topics. With this technique complementary as well as amplified effects can be obtained. Also experimental data gained from one of the methods in different measuring configurations can be combined reasonably (e.g. radar data recorded in different polarisation configurations and/or with different frequencies of the antennas). Further on simulation calculations of the different wave propagations (acoustic and electromagnetic) are planned, which also can be consulted for data fusion. The experimental data derived from acoustic and electromagnetic methods contain to some extent complementary information about the concrete construction under test. The propagation of acoustic impulses (ultrasonic or impact-echo) is mainly influenced by the mechanical properties. The dielectric properties influence the transmission, absorption and reflection of the electromagnetic impulses (radar). Additionally, these parameters depend on the frequency of the used signals. Therefore, in most applications the information content is increased through a combination of the methods. Up to now, only few studies have been performed on the combination of radar, ultrasonic and impact-echo. At BAM, first investigations about combination of radar and ultrasonic methods were realized by thickness measurements of slabs . Further investigations with radar, ultrasonic and impact-echo were performed at test specimens for the localisation of tendon ducts and detection of grouting faults inside the ducts [3,5]. These investigations showed the ability of the radar method to perform fast contact-free measurements of large areas. Investigations on complex concrete constructions like sluices have shown that a combination of NDT methods is a very powerful tool  to get information on the integrity. So far in none of these investigations experimental data from the same array were combined directly. Systematic investigations on data fusion of combined methods are required, especially for problems in concrete construction, like detection of voids, honeycombing, delaminations, constructional elements and grouting faults in tendon ducts and also for thickness measurement on structures which are only accessible from one side and investigation of multi-layer systems. In this paper, first the different impulse-echo methods are described briefly. Subsequently, the pre-processing of the different data sets recorded of the same volume and the algorithms of the data fusion are presented. Finally the results are exposed and summarized. The ground penetrating radar (GPR or impulse radar) as applied in civil engineering is based on the principle of the georadar. This technology is already established for more than a half century and successfully used in geophysics for soil investigation . 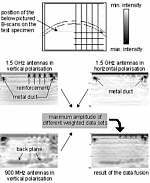 By the development of high frequency antennas as well as of efficient computer systems it is now possible to examine small structures with enhanced resolution. Thus since ten years and more this method can also be applied to building structures. The main tasks are structural investigations of concrete and masonry elements [8,9,10]. Since moisture is influencing the dielectric properties of building materials, radar can also be applied to moisture measurements [11,12]. The radar method is based on the propagation of electromagnetic impulses having maximum frequencies between 300 MHz and 2.5 GHz for civil engineering applications. As shown in Figure 1, the waves are emitted by an antenna (transmitter) which is generally in contact with the structure under investigation and which is moved along the surface. The transmitting impulses are reflected at interfaces of materials with different dielectric properties, i. e. at surfaces, rebars, tendon ducts, voids, interfaces of multilayers and at the backside of the structure under investigation. The reflected impulses are detected by a second antenna (receiver), also positioned on the surface close to the transmitting antenna. In most cases both antennas are in the same housing. Fig 1: principle of radar. For visualisation of data sets, the detected signals (intensity as a function of time, A-scan) recorded at different antenna positions can be displayed as images (radargram or B-scan). Here, the intensity is converted to a greyscaled or coloured presentation. If the propagation velocity in the investigated medium is known, the travel time of the reflected impulses can be presented as a depth scale. Ultrasonic echo is used since a long time for the investigation of homogeneous materials like metals or for medical applications with high resolution. At the beginning of the 90's most of the experts underestimated the potential of ultrasonic measurements on inhomogeneous materials like concrete. Through intensive research and development during the last decade the difficulties of testing concrete had been partly solved. This is mainly due to the development of new types of broadband transducers operating in the lower frequency range between 50 and 250kHz and to the application of the principle of the synthetic aperture [13,14]. For this, ultrasonic measurements are carried out at many points of the surface and are evaluated by means of reconstruction calculations, which show the location and distribution of acoustic reflectors and scatterers in the volume of the tested concrete element. Today for example thickness determination , investigation of reinforcement and tendon ducts [3,5] and the characterisation of surface cracks [15,16] are applications of high practical value. The ultrasonic echo principle is similar to ground penetrating radar. The ultrasonic impulses are reflected at interfaces where the acoustic impedance (depending on mechanical properties) is changing. The distance from the inhomogeneities to the transceiver can be calculated from the run time of the acoustic impulse if the propagation velocity is known. In contradiction to radar, for the interpretation of acoustic reflected waves it must be considered that at each reflection center mode conversion generating longitudinal as well as transversal waves takes part . There are different possibilities for data visualisation of the experimental results. This requires data recording along parallel traces enabling the generation of a 3 dimensional data cube. An A-scan as described above is the result of a point measurement. Here, the detected intensity of the reflections is presented as a function of time (see Figure 1). If the propagation velocity of radar resp. ultrasonic waves in concrete is known and const., the time scale can be converted into a depth scale. The intensity and the phase of the signal depend on the distance and on the properties of the structures in the concrete. 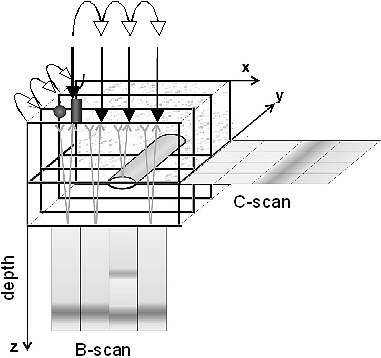 Fig 2: schematic illustration of B-scan and C-scan generation in a 3 dimensional data cube. If a whole trace was recorded, the plot of these A-scans along a line on the surface is called B-scan (or radargram for radar data). The result is equivalent to a slice perpendicular through the plane in trace direction. In the B-scan the intensities are represented 2 dimensionally in assigned colors or grey scale. For the generation of a 3 dimensional data cube the surface of the element under investigation must be measured systematically in a close 2 dimensional grid. Then the B-scans describe in their completeness a 3 dimensional array. Slices parallel to the surface plane are called C-scans (or time slice or depth slice) as demonstrated in Figure 2. With C-scans complex structural elements like inclined reinforcements or tendon ducts located in the area can be visualised and analysed layer for layer. D-scans are slices perpendicular to the surface plane and perpendicular to the recorded traces. It is also possible to represent arbitrary cuts in any plane of the array. The aim of data fusion is to combine the advantages of the different NDT methods. The advantage of the radar method compared to the acoustic methods is that larger surfaces can be examined in short time without any coupling agent. But with increasing reinforcement the significance of the radar method decreases, because most of the intensity of the electromagnetic impulses is reflected at the metallic reflectors and thus the signals contain fewer information about the structures behind (i. e. no electromagnetic waves transmit if the distance of the rebars is less than 7cm). The acoustic methods can compensate this deficit, since they can penetrate through metal. Metallic structures have a similar effect on electromagnetic waves like air gaps have on ultrasonic waves. For the radar method air layers have smaller influence, so that both methods complement each other very well. First the different data sets must be adapted to each other. In the volumetric areas to be investigated the density of data points must be comparable. In a second step each data set has to be reconstructed considering the different shapes of reflection pattern from inhomogeneities as well as inhomogeneous distribution of propagation velocity. I. e. in the B-scan a small reflector recorded with radar as well as with ultrasonic appears as hyperbola due to the opening angle of beam of transmitter and receiver as visualised in Figure 3. Since both angles of beam of the two methods are different, the fusion of raw data might lead to reflection pattern which are difficult to analyse. Further on an electromagnetic impulse transmitted from a radar antenna consists typically of three sinusoidal half waves while an ultrasonic impulse has only one peak. Fig 3: B-scan of radar (radargram). Using a Synthetic Aperture Focusing Technique (SAFT) algorithm [18,19,20] radar and ultrasonic data can be reconstructed. The principle of SAFT reconstruction is schematically represented in Figure 4. For the reconstruction it is necessary to convert the time information into the depth information. In the following the different amplitudes of A-scans must be added depending of the depth and position of the A-scan. On the position of reflectors the high amplitudes superimpose leading to an intense reflection. On other positions the amplitudes interfere destructively. After reconstruction data conversion has to be carried out. This requires the definition of a common data format, also to keep the data exchange between the project partners as simple as possible. Subsequently, the converted data sets can be read by the data fusion software and is transferred into a common reference system considering different resolutions and geometries. Fig 4: theoretical basics of SAFT reconstruction. Before the fusion each data set can be weighted related to the depth scale. For this purpose constant, linear and non-linear functions are available. For example such weighting is reasonable, if two data sets with different information in the depth are fused. The equations (1), (2), (3) are suitable only for the combination of complete data sets. The data sets must have the same size and same resolution. In contrast to this also incomplete data sets can be fused with the equations (4) and (5). The equations (2) and (3) are intended for the fusion of experimental data sets and numerical simulations. By combination of measurements before and after the filling of tendon ducts these operations are also applicable to detect a temporal change in the duct. Figure 5 shows a simple concrete test specimen with dimensions of 2,0mx1,5mx0,5m which was used for radar and ultrasonic investigations. Vertical and horizontal reinforcement bars are built in from both sides in the right half of the specimen. Furthermore a parabolic metallic tendon duct filled with cement paste is integrated. During the filling of the duct, compaction faults were simulated with polystyrene blocks. From one side, the test specimen was investigated with radar using the 1.5GHz and the 900MHz antennas, both in two polarisation configurations. Along the whole surface of the specimen, vertical and horizontal traces were recorded with a spacing of 5cm. From the other side on a smaller area above a known compaction fault of the tendon duct, ultrasonic data were taken using a transducer array with probes having a nominal frequency of 85kHz. Fig 5: Views of the concrete test specimen 2,0 x 1,5 x 0,5 m3. The used radar antennas (Bow-Tie antennas) emit polarised impulses, i. e. the electric field of the electromagnetic radiation is aligned parallel to the dipole axis of the antenna and the orientation is constant in time. If the reinforcements are arranged axially parallel to the direction of the polarisation, the reflected electromagnetic impulse is very strong in comparison to the orthographic reinforcement bars. This effect can be exploited for the search of reinforcement (antenna dipole is parallel to the rebars) or for the detection of structures behind the reinforcement (antenna dipole is perpendicular to the rebars). Figure 6 demonstrates the influence of polarisations on the detection of different aligned reinforcements. In the top left of Figure 6 a C-scan of one data set produced with a vertical oriented antenna is pictured. Another C-scan of one data set, investigated with a horizontal polarised antenna, is placed beside it. Fig 6: Top: C-scans of radar data recorded in different polarizations; bottom: results of data fusion using equation (1) (left) and equation (4) (right). All C-scans represent a depth of 55 mm and a cutout of 1,8 x 1,3 m2. Depending on the polarisation, the vertical or horizontal reinforcements in the right half of the C-scans are well identifiable. After the addition of both data sets (data fusion using equation (2)) the vertical and horizontal reinforcements can be identified in the C-scan (see Figure 6 down left). The best visual presentation (both rebar directions have equal intensities, best resolution) can be achieved with the equation (4). Here the amplitudes of the different data sets are compared and the maximum amplitude is saved in the fusion data set. The result of this operation is shown in Figure 6 bottom. Apart from the polarisation the frequency of the signals emitted from the radar antennas has also a great influence on the measurement result. Increasing frequencies ascend the resolution and descend the penetration depth. This behaviour is visualised in Figure 7. In the B-scans recorded with the 1.5 GHz antenna, the reinforcement bars and the tendon duct are well recognizable compared to the B-scans measured with the 900MHz antennas. The resolution of reflections from the tendon duct und reinforcement bars obtained with the 900MHz antenna is much worse. The advantage of the 900MHz antenna is the higher penetration depth. So the back side of the test specimen can be detected with this antenna (Figure 7, bottom left). This is not possible with the 1.5GHz antenna. 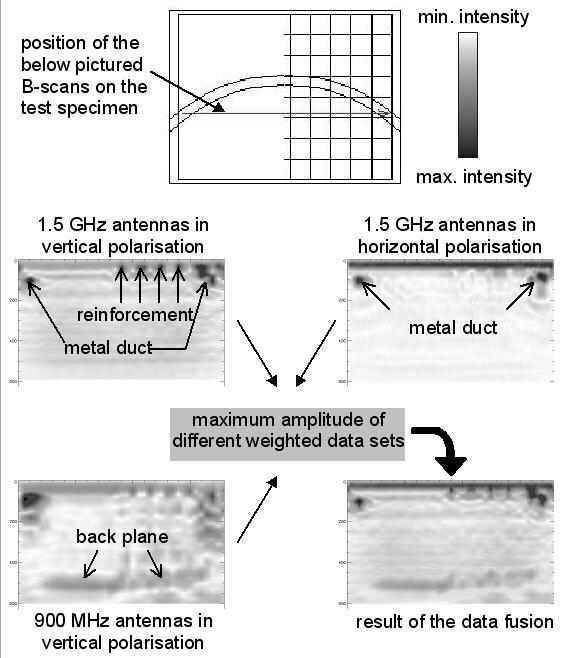 The result of data fusion for the different polarisations as described in chapter 4.2.1 was combined with the weighted data set measured with the 900MHz antenna using equation (4). Fig 7: B-scans (see position in the drawing, cutoff of 1,8 x 0,6 m²) of radar measurements. 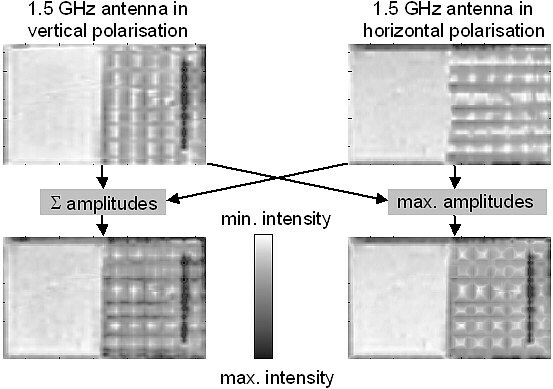 Top left: 1.5 GHz antenna, vertical polarization; top right: 1.5 GHz, horizontal polarisation; bottom left: 900 MHz antenna, vertical polarisation; bottom right: result of data fusion of the three B-scans using equation (4). The output of the fusion is shown as a B-scan in Figure 7 (bottom right). In this B-scan the reinforcement, the tendon duct and also the back plane can be seen. This B-scan present a reasonable combination of data sets as a result of compression of important information in one data set. The top left C-scan in Figure 8at a depth of 5 cm visualises all reinforcing bars due to fusion of radar data sets with different polarisation. This results also in a good reconstruction of the tendon duct in the reinforced region in the C-scan at a depth of 11 cm (C-scan top right). In the bottom left C-scan, the advantages of data fusion are demonstrated: the injection fault in the duct detected with ultrasonic is clearly shown at a depth of 14 cm. The bottom right C-scan was taken at the position of the back side of the test specimen, which could only be detected with the 900MHz radar antenna in the region without reinforcement. Here also the shading of the tendon duct is shown. 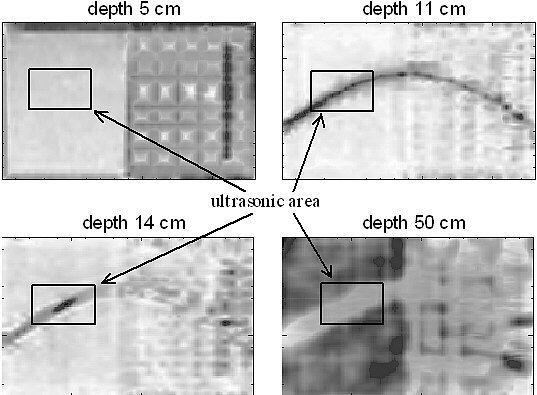 Fig 8: Four C-scans (1,8 x 1,3 m2) representing different depth slices of the data set calculated by data fusion of radar and ultrasonic data sets. In this contribution, data fusion is demonstrated at data sets recorded with two non-destructive testing methods applied in civil engineering. Here, data recorded with radar in different transmitter and receiver configurations as well as with an ultrasonic array are combined and presented. The experimental data have been recoded at a concrete test specimen simulating a geometry similar to prestressed concrete bridges. The results of data fusion clearly demonstrate the high information density obtained by the combination of complementary configurations and methods. Further investigations are planned including also the experimental results of different ultrasonic set-up using transducers with point contact in array geometry, of impact-echo data and of data recorded by numerical simulation. Also additional algorithms for data fusion will be applied. This work was funded by the Deutsche Forschungsgemeinschaft in the frame of the research project FOR 384 Non-destructive evaluation of concrete structures using acoustic and electro-magnetic methods. Furthermore, the authors are indebted to Prof. Dr. K. J. Langenberg and Dr. K. Mayer of University Kassel for providing their 3D FT-SAFT program. The authors also wish to thank Dr. W. Müller of IzfP Saarbrücken for the reconstruction of the ultrasonic data sets. Last but not least the author Christoph Kohl would like to thank Prof. Dr.-Ing. B. Hillemeier for the supervision of the dissertation. Bungey, J. H., Millard, S. G. and M. R. Shaw: Radar assessment of post-tensioned concrete, Proc. : 7th Int. Conf. on Structural Faults and Repair, Vol. 1, Forde, M. C. (ed. ), Edinburgh, 1997, Engineering Technics Press, pp. 331-339.